thanks for the useful chart of options. i know that UFile has an optimization for the new pension sharing for seniors that could easily pay for itself. i would take caution and would at least plug my numbers into ufile.ca to see if i'm getting the most back as possible. I've posted reviews on StudioTax 2007 (http://www.squawkfox.com/2008/01/27/review-studiotax-2007/) and UFile 2007 (http://www.squawkfox.com/2008/01/13/review-ufile-standard-2007/). I'm really interested in what you think of TaxFreeway since I use a Mac at home. I am curious as to why you picked StudioTax over Taxfreeway. Is it primarily the low cost or is it also functionaly preferred? I like many others am fed up with QuickTax's continually price increases and reduction in # of returns allowed. My main beef with Ufile is it does not allow you to enter directly to returns and only has the interview entry approach. 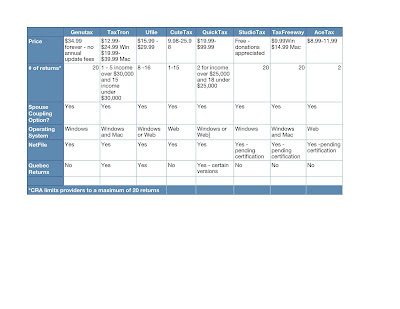 I chose StudioTax over TaxFreeway for Windows purely based on cost. I think that both programs are very similar in terms of ease of use and functionality. For all the price differences with all the different tax packages at the end of the day, they'll all get your taxes done. The differences between most programs are nominal and the I personally feel that the lower cost product is the way to go. I would really like to read about positive results people have with "optimization". I must admit I don't buy into the hype. Please help me believe the TV commercials for Ufile and Quicktax. I want to think product A can give me a bigger refund.. but my intelligence tells me the tax laws are equal and as long as I claim things properly, I will get the same result. There is no broken software, just broken users. Great review. I used (and reviewed) StudioTax’07 and would certainly recommend it to individuals.